alaTest has collected and analyzed 36 reviews of LG 43UH750 Series. The average rating for this product is 4.5/5, compared to an average rating of 4.6/5 for other products in the same category for all reviews. People really like the design and remote control. The sound and usability also get good opinions. There are some mixed reviews about the glare. There are some less positive opinions about the color. We analyzed user and expert ratings, product age and more factors. 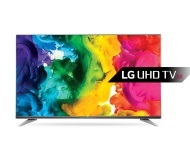 Compared to other products in the same category the LG 43UH750 Series is awarded an overall alaScore™ of 89/100 = Very good quality. Bought this, nice item. Build and picture quality good. No complaints. Service from Very good. Excellent smart TV. Picture quality is great, use of Amazon Prime and other apps work well and 4K viewing is tremendous for HD channels. Very happy with the LG TV. this is a very good tv once you get the settings right in particular the sound which can be tricky, but overall this is a great tv. Excellent service, all options and technical data explained fully and understandably, very happy with purchase and would recommend Richer Sounds before any other retailer.